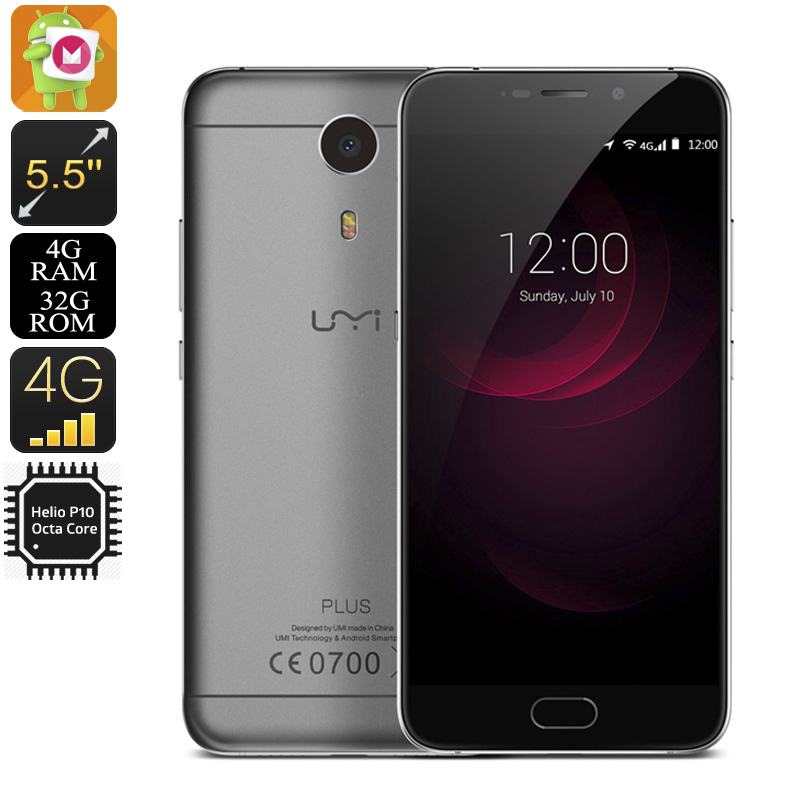 Successfully Added HK Warehouse UMI Plus Android 6.0 Smartphone - Octa-Core CPU, 4GB RAM, 1080p, 20 Hours Usage Time, 4G, 13MP Camera (Grey) to your Shopping Cart. With the release of their newest smartphone, the UMI Plus, UMI has just launched its latest flagship smartphone that is about to rock the mobile phone industry. With its stunning design and powerful hardware this android 6.0 smartphone is a beauty from both the outside and inside. Adopting an aircraft grade aluminum alloy and slightly curved body along with a large 5.5 inch 1080p FHD display the UMI Plus features a premium design that feels incredible to the hand. Thanks to its almost invisible bezel and high screen-to-body ratio this Chinese smartphone is noticeably more compact compared to most other 5.5 inch smartphones out there. Powered by an Octa-Core Media Tek Helio P10 CPU the UMI Plus packs some serious power. With its TSMC HPC Plus technology this CPU has the best Energy Efficiency Ratio of all Media Tek processors, providing you with an energy efficient smartphone that, in combination with its massive 4000mAh battery, can provide you up to an unnatural 20 hours of continuous usage time. This provides you with enough juice to enjoy all the latest Apps, most demanding 3D games, and stunning FHD movies for hours in a row. Featuring a Mali-T860 64-bit GPU along with 4GB of RAM this android smartphone enhances your mobile entertainment experience by providing you stunningly beautiful and sharp images. No matter what you throw at this beauty, the UMI Plus is guaranteed to handle even the most extreme situations without any lag. Offering up to an unbelievable 256GB or external storage space the UMI Plus offers plenty of space to store all your files, pictures, and media alike. Capture stunning professional-quality images with an amazing 13MP rear camera. Featuring ultra-fast focusing and PDAF Technology this magnificent camera allows you to capture photos with exceptional image quality. With its high color saturation and sunlight-readable display this Chinese smartphone delivers vivid colors and portraits sharp images that are clearly visible no matter you’re inside or outside. This provides you with a perfect smartphone to snap and edit your photo’s at any given moment. This UMI Plus comes with a 12 months warranty, brought to you by the leader in Chinese smartphones as well as wholesale electronic gadgets..